Like a lot of people this time of year, I had some leftover mashed potatoes (ok, a LOT leftover... who knew 3 potatoes would make that much!). I decided to try my hand at potato pancakes this morning. Wow! 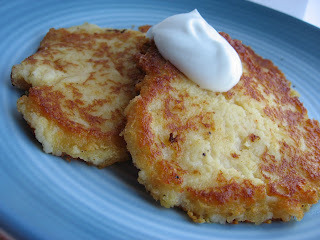 I've never had potato pancakes before, so maybe that was part of the infatuation, but I loved these! I started with a recipe from Allrecipes.com, and doctored it up a bit (shown in italics). In a medium bowl, mix together potatoes, beaten egg, salt, cayenne, black pepper, onion powder, flour, Frank's, and cheese. Heat oil on a large griddle at medium heat. Drop potato mixture onto griddle 1/4 cup at a time. Flatten with a spatula to 1/2 inch thick. Fry approximately 5 minutes on each side, until golden brown. Serve hot with sour cream. I was afraid to go to far with the heat (spice) on these, but next time they could stand a little more, so I'll kick it up a bit. 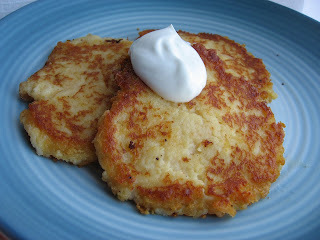 Overall... these had me wishing for more leftover mashed potatoes!